How do you compare the cost of driving an electric car, versus a gasoline powered car? Many look to electric cars as a refuge from high gasoline costs, but because electricity doesn't come by the gallon it's hard to compare the savings. The U.S. Dept. of Energy released on Tuesday the eGallon metric, meant to help drivers compare driving costs between gasoline and electrically powered cars. According to the DoE, electricity costs the equivalent to $1.14 per gallon across the U.S., however the exist cost per state depends on local factors such as electricity prices. Their method to arrive at $1.14 per gallon is similar to a methodology we covered earlier (see Why electric cars are cheaper to drive than gasoline cars). A year ago, PG&E claimed their proposed EV owner electricity rate would work out to an equivalent fuel cost of $1 per gallon, again using similar reasoning. The reasoning is fairly simple: The cost of electricity required to drive the distance that 1 gallon of gasoline for a similar gasoline powered vehicle. Note this does not take into account the full lifecycle cost of vehicle ownership, but the day-day operational cost. Electric vehicle owners know there are many cost savings with electric vehicle ownership, such as maintenance (e.g. fewer brake pad replacements, and no oil changes). More information is available at Energy.gov/eGallon. They offer a drop-down to explore the eGallon figure for the country as a whole, or per state. Electricity costs vary from state to state, depending on local policies. The more expensive electricity is, the higher will be the eGallon cost. 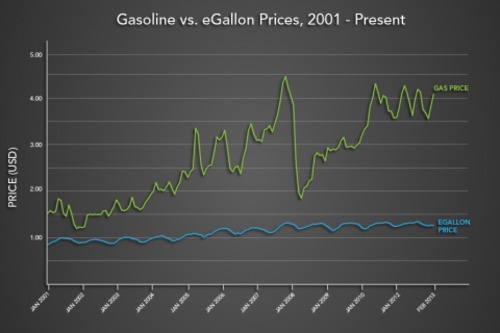 However over the long term electricity prices are more stable than gasoline prices. Electricity prices are set by stodgy utility commissions, while gasoline prices are set by, uh, who? The eGallon figure has a simple calculation: MPG of an equivalent gasoline car times the kilowatt-hours consumed per mile times the cost per kilowatt-hour for electricity times. At 28.2 miles/gallon fuel efficiency of top selling cars in 2012, 0.35 kilowatt-hours consumption per mile averaged over the electric cars available in 2012, and the 12.33 cents per kilowatt hour average electricity cost over the country, the eGallon cost is $1.22. To calculate a more accurate eGallon figure, one should choose a specific gas car to correspond to a specific electric car, to give the actual efficiency figures (MPG and kWh/mile), and then to use your own local electricity rate. An individual can also affect these numbers by, for example, installing solar panels on their house to lower their personal cost for electricity.